PPC Management - Complicated? Time-consuming? No worries! Pay little and Hand this trouble over to NiceNIC.NET! 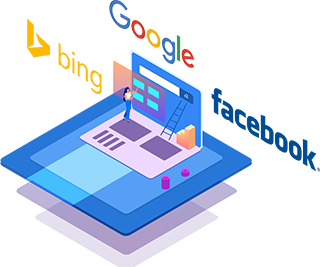 Pay Per Click PPC campaigns launching, deploying and maintaining by NiceNIC.NET, are effective solutions that deliver productive returns on your investment (ROI). Whether you are a SME or a large enterprise, our experienced team of dedicated professionals and campaign managers will have your Pay Per Click campaign up and running forthwith. We implement proven PPC methodologies to attract fast pre-qualified traffic to your website for targeted keywords. Our professionals will handle distribution and placement analysis for your website. It includes a list of costs for top ranking on Google Adwords, Bing Ads and Facebook Advertising! Search Marketing and other search engines for target keywords and its proper combinations. Pay Per Click management requires continuous monitoring, analysis, research and extensive setup. Our campaign managers would help you create PPC Advertising campaign with all the major PPC search engines, work within your monthly budget, and ensure higher ROI and conversions for your campaigns.